Honor Roll Member – Eby, Mabel (Warner) « Perry High School Alumni Association, Inc.
Mabel Warner Eby was born October 17, 1912 in Perry to Will and Edith Warner. She attended school in a one room schoolhouse “Pioneer District #40” five miles East of Perry through 6th grade. Mabel graduated Perry High School in the class of 1929 at the age of 16 after two double promotions, then attended one year of graduate studies in accounting from Hill’s Business College. Mabel became the Deputy County Treasurer before she was old enough to vote. She took that accounting knowledge to work for Eby’s Cleaners from 1948 until its close in 1980. On December 10, 1933 she married Frank Eby. Generations of Perry residents saw them riding the bicycle built-for-two in the 16th Celebration parade without fail for some 50 years. The 16th Celebration was very special to Mabel. She designed and built many floats for the parade and served as Grand Marshal at age 100. Mabel was involved in volunteering for and supporting Perry organizations throughout her life. She was founder and member of the Ladies Tuesday Afternoon Club where she was President and Secretary and was a member of the Marigold Garden Club. She volunteered at the Cherokee Strip Museum, supported the Carnegie Library, took care of the plantings at the YMCA and was in charge of the Art and Photography Division of the Noble County Fair. 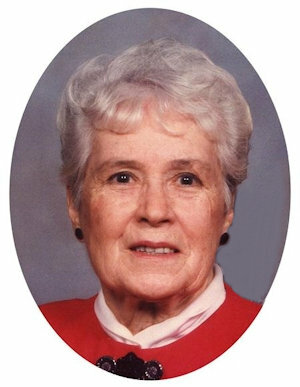 She was a life member of the Cherokee Strip Historical Society and the Perry High School Alumni Association. She was an active member of the First Christian Church and founded and taught the TNT Sunday School class at the First Methodist Church. She received many Perry honors including 2013 Woman of the Year and May Day Queen for the Centennial Celebration. She was selected Sunday Oklahoman Woman of the Month for her original quilts and costumes. Mabel loved working in her garden and piecing quilts. She and Frank raised five children, Joy Eby, Jay Eby, Anne Eby Scott, Bill Eby and Jim Ed Eby.